Isn't that little beach ball so stinkin' cute?! 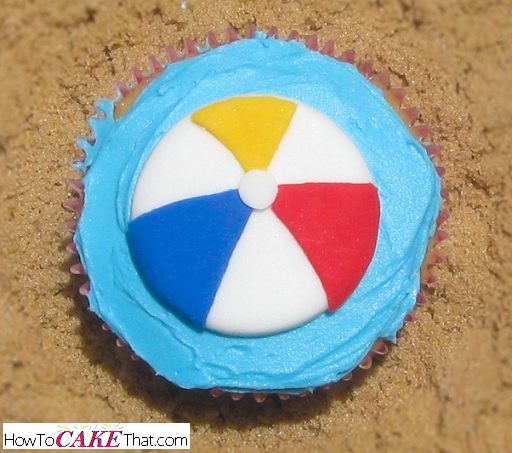 Any summer pool party host would be thrilled to have these beach ball cupcakes on his or her dessert table! 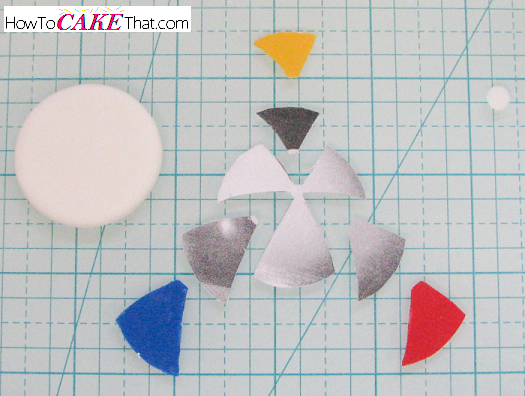 Learn how to make these super cute cupcake toppers in this easy-to-follow tutorial! To begin this tutorial, we must make a beach ball template. Print out a picture of a beach ball in an appropriate size for your cupcakes. Use clear masking tape to cover the front and back of the image to protect it from moisture. To find an image of a beach ball, search on Google. Or to use the exact image I used, click here. Cut out the beach ball image. Next, find a round cutter in the same size or as close as you can get to the size of your beach ball. 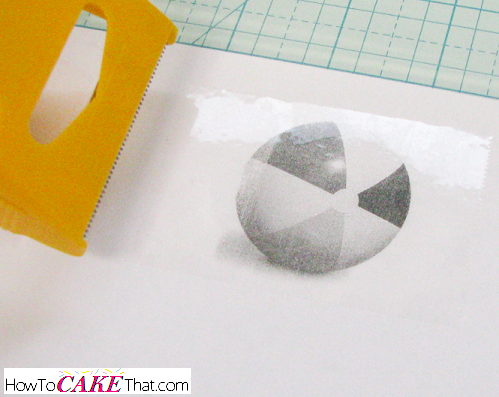 Using a sharp Xacto or craft knife, cut and remove the three colored pieces (the dark pieces of my printout) of the ball. Be sure to cut a little into the center small white circle where the colors would join to allow the colored pieces to be slightly longer. This will give us a little extra to work with in case something doesn't match up. For this topper feel free to use all fondant, a fondant and gum paste blend, or all gum paste. Dust work surface with cornstarch and roll out white fondant to desired thickness. Keep in mind the white fondant will be the background for the beach ball, so it should be a little thick. My background is a little less than 1/8 inch thick. Cut out as many beach balls as needed for your project. 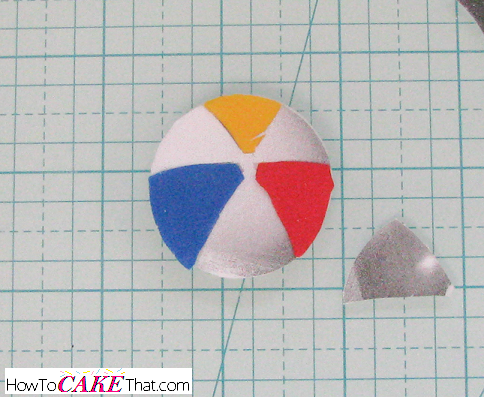 Next, we are going to cut out the little white round piece that covers where the points of the beach ball's colors join. Dust your work surface with cornstarch and roll out white fondant as thin as you can get it without it tearing or becoming too see-through. Using a round object such as a straw or a round piping tip, cut out the same number of pieces as beach balls. Set little round pieces aside to dry. Now it's time to color the fondant that will fill in the colored sections of the beach ball. 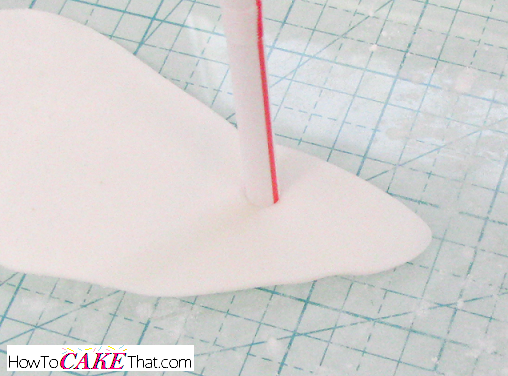 Dust your work surface with cornstarch and roll out your colored fondant as thin as you can get it without it tearing. Allow it to sit to stiffen a little bit. Fondant will be ready to cut when it can be cut without stretching too much. For fondant, check for readiness after 30 minutes. For fondant and gum paste blend, check after 15 minutes. For all gum paste, check for readiness after 10 minutes. These times are only estimates and drying will vary depending on climate and weather. 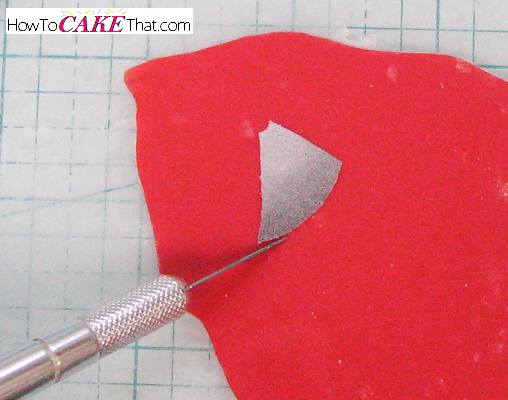 When fondant is ready, place a colored template piece over your colored fondant. Cut out template piece using a sharp Xacto knife. Be sure to hold template piece in place as you cut around it. Now it's time to place the colored pieces on the beach ball's background. 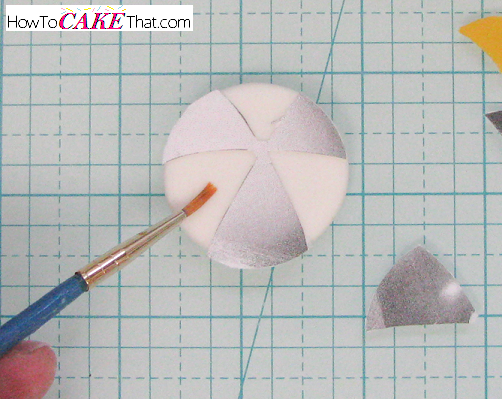 Line up the template pieces along with the colored fondant pieces for easy placement when we glue them to the background. 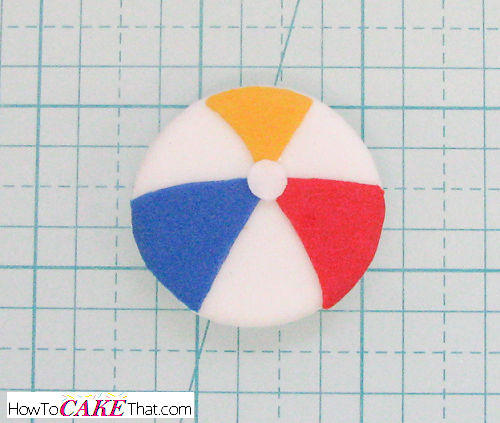 Place the large white paper template piece over your white fondant beach ball background. 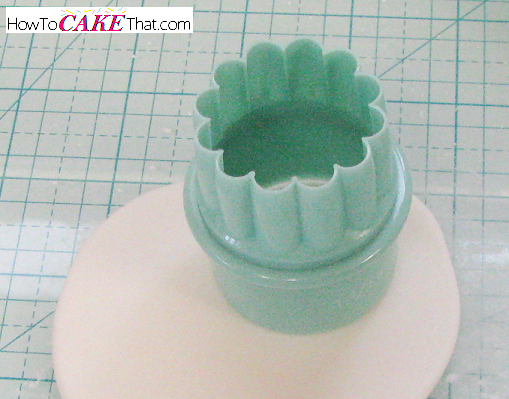 Lightly brush a little water onto the uncovered fondant sections. Be sure to not add too much water or the excess water will cause the colored fondant pieces to bleed onto the white sections. 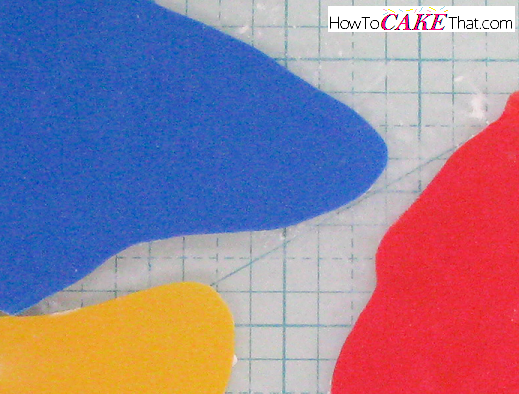 Place the colored fondant pieces where they belong around the paper template. Remove the paper template to reveal perfectly placed beach ball sections! 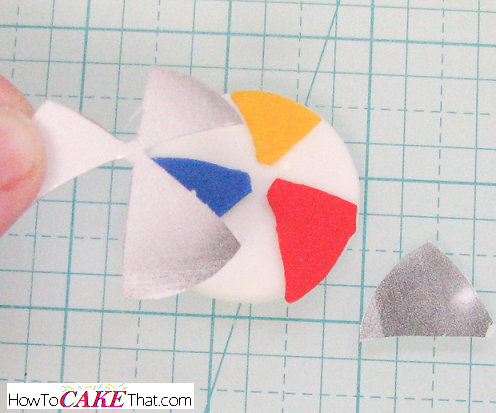 Brush a tiny bit of water on the back of the little white circle piece and place where the beach ball colors meet. Allow topper to dry overnight or until completely dry. 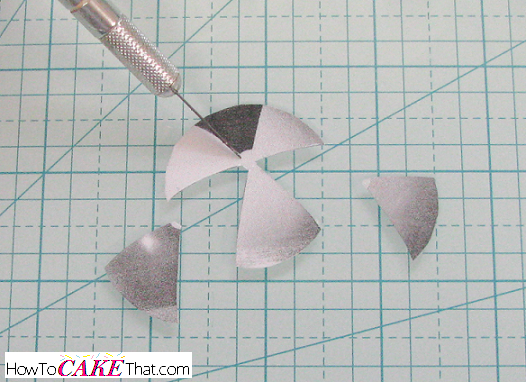 After it has dried, trim any excess fondant pieces with an Xacto knife or razor blade to neaten. Place your beach ball topper on a cupcake frosted with blue frosting to look like it's floating on water! I colored my frosting with Wilton's Sky Blue gel color with just a touch of Wilton's Royal Blue. 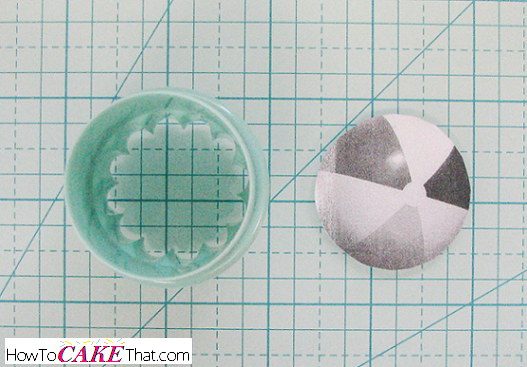 And that's how you make this adorable Summertime cupcake topper! I hope you have enjoyed this tutorial! God bless! !